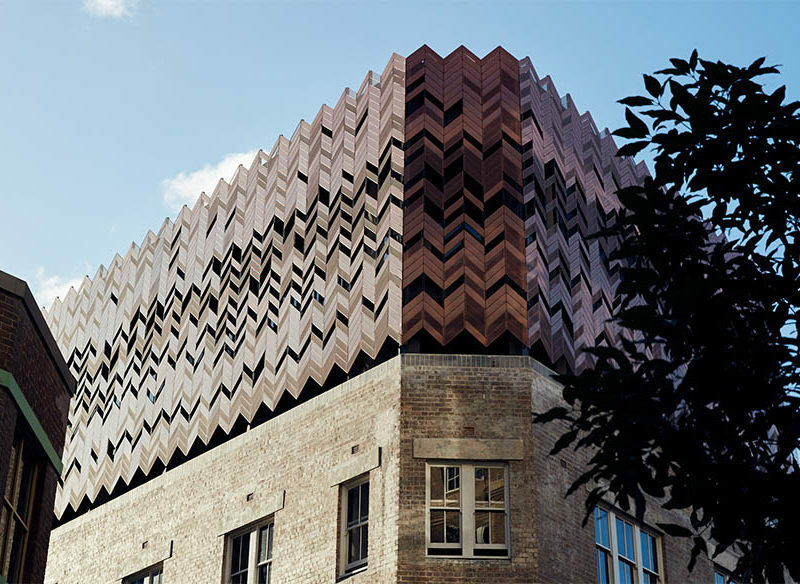 In the space of five months, one pocket of Surry Hills received a major boost in the heritage building-turned-cultural destination stakes. 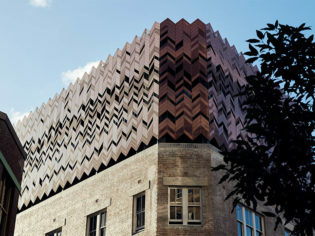 In October last year, the much-anticipated restaurant Chin Chin opened in the iconic Griffiths Teas building on Commonwealth Street and in March, Paramount House Hotel was launched across the road, in the former headquarters of Paramount Pictures and its adjoining film storage warehouse. The new boutique digs joined the existing complex of the Golden Age Cinema and Bar, Paramount Coffee Project and co-working studio The Office Space. Rooftop workout/hangout spot Paramount Recreation Club later completed the picture. It’s pitched as a neighbourhood hotel, and executed as a one-stop lifestyle destination for a particular kind of design-minded, indie magazine-reading, coffee bean-conscious clientele. This is evident from the moment I arrive at the cool and calm atrium-style lobby, which is reached via the ground-floor cafe and populated by plants and prerequisite Mac users. I’m offered a welcome drink of amber sour ale from local Marrickville brewery Wildflower while staff members – friendly, helpful and unimposing – swiftly check me in. There are 27 rooms and two suites in total, and the second-floor Sunny room I’ve booked – as opposed to the Everyday, Loft and Mack Daddy options that make up the other three levels – proves to be ironic as it’s a day of epic Sydney rain. But its sunny disposition compensates for the inclement conditions outside. The welcome scent of Aesop greets me – the room is well-stocked with the brand’s products, as well as a host of other locally made goods including cured meats by LP’s Quality Meats, Black Pantry marshmallows and William Downie pinot noir in the mini-bar. The cleverly allocated space (which includes a separate shower, toilet and vanity area) occupies a length of the building that looks onto Commonwealth Street, with plenty of sash windows and an alcove at the far end full of greenery. Melbourne-based architects Breathe have let the bones of the building – such as original brick walls and their patina of old paint – shine through, and outlined them with stylish, complementary details like raw brass fixtures and terrazzo surfaces. Each additional detail is similarly considered, from the vide poche designed by Sydney’s Henry Wilson and earthy ceramic mugs made by Brisbane studio Commons Ceramics. At the centre of the room is a daybed topped with a green velvet cushion, and a large squishy bed dressed with French linens in dusk, indigo and stripes, and a recycled wool blanket made by Tasmania’s Seljak Brand in collaboration with the hotel. It’s all very curated, but doesn’t feel over-engineered. It feels eclectic, lived in and artful. From here, it’s no effort to nip downstairs to watch a film at the Golden Age’s arthouse cinema (which occupies the site’s old screening room) and enjoy a nightcap in its adjoining bar; or to have breakfast the next morning at the Paramount Coffee Project. I’ll have to return to eat dinner at Poly, a spin-off of lauded Chippendale restaurant Ester that was yet to open when I visited. It’s a complete vision: a celebration of all things creative in Sydney and Australia. For those of us looking to stay somewhere that fast-tracks us to the heart of local culture in impeccable style, we won’t find a better option than Paramount House Hotel. A beautiful heritage building stylishly and individualistically restored that gets right to the heart of Sydney’s cultural life. The design details, like the raw brass fixtures on the elegant standalone basin. The hotel’s accoutrements – bespoke blankets and mugs, etc. – are lovely; and the fact that you can purchase many of them as a souvenir from the retail section at reception is a nice touch, however I can’t help but feel I am being a little ‘sold to’. Perhaps credit for guests at the cinema or cafe would counter this, and feel like a gesture for ‘locals’. I paid $360 for one night in a Sunny room.